This itinerary covers many different safari destinations. You will find each of them unique and it is well worth the effort to visit them all. After breakfast, you will be driven to Arusha National Park for game viewing. Lunch at Momela. After lunch continue with game viewing, dinner and overnight in Arusha town. 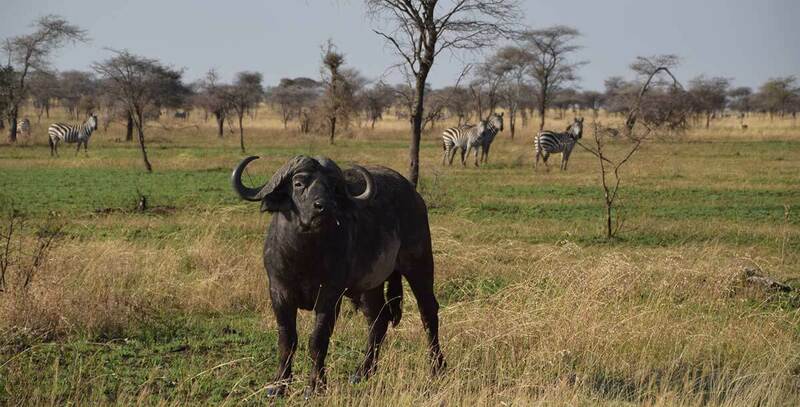 After breakfast, you will be driven to Tarangire National Park for game viewing. Meals and overnight at either lodge or campsite. After breakfast transfer to Lake Manyara National Park for game viewing, followed by a break for lunch. After lunch you will continue for more game viewing. Dinner and overnight at either lodge or campsite. After breakfast transfer to Serengeti National Park through the Ngorongoro Conservation Area highlands with your lunch box and game viewing en-route. Dinner and overnight at either lodge or campsite. After breakfast take a half day game viewing in Serengeti park, lunch in the Serengeti, then transfer to Ngorongoro Conservation Area with game viewing en-route. Dinner and overnight at either lodge or campsite at the crater rim. Day 6: Ngorongoro Crater & return. After breakfast, with packed lunch descend into the crater for game viewing. In the late afternoon, drive back to your hotel in Moshi/Arusha.